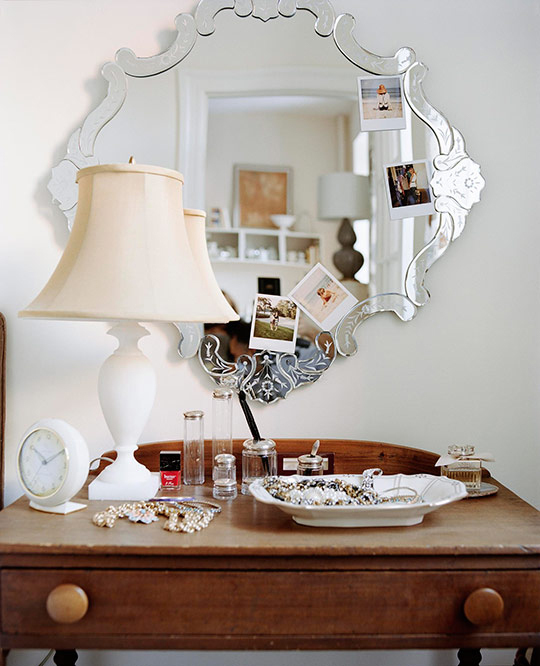 Mirrors are as common in decorating as wall paint, but a particularly stylish one can lend sparkle to an entire room. Read on for some of our most memorable mirrors. Notes of blue and gold throughout the dining room are exhibited beautifully in the painted commode and giltwood mirror shown here. 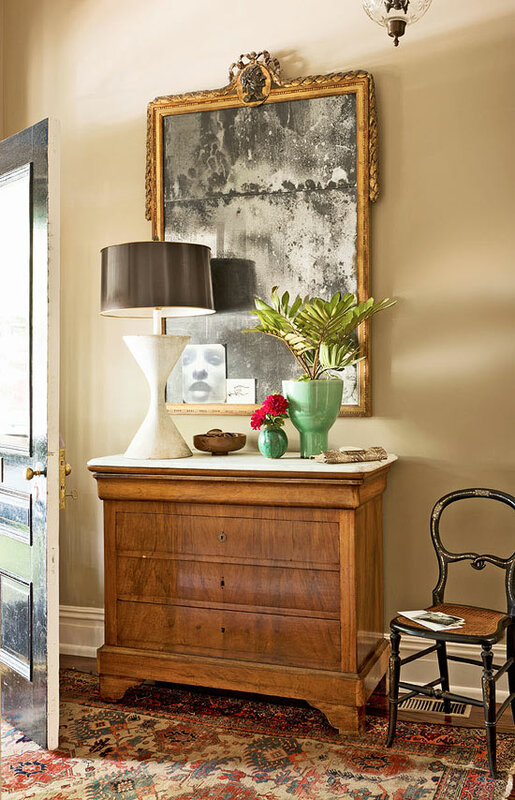 The mirror’s traditional detailing complements the hand-stenciled, striated walls behind. The mirror’s worn finish incorporates the blues of the commode and the Louis XVI-style chair as well as glints of gold to add sparkle. See more of this home here. On a towering fireplace made of stacked stones hangs a dramatic mirror that follows the mantel up to the ceiling. The mirror’s verticality is also reflected in the cascading draperies adorning the two-story floor-to-ceiling windows. Aside from its sheer drama, we appreciate how the tall mirror borrowed its linear pattern from the lines formed by the stacked stones of the fireplace. Tour the rest of this holiday home. The rich mahogany of this shapely mirror and matching console below bring warmth to this formal dining room’s cool blue palette. The thick frame lends visual weight to the wall space. The mahogany frame’s shiny finish highlights its intricate carvings, which lends a lovely texture to the scene. Explore the rest of this beach house here. A Louis XVI trumeau mirror forms the backdrop of a lovely bedroom vignette, which includes a limestone bust and crystal candlesticks. 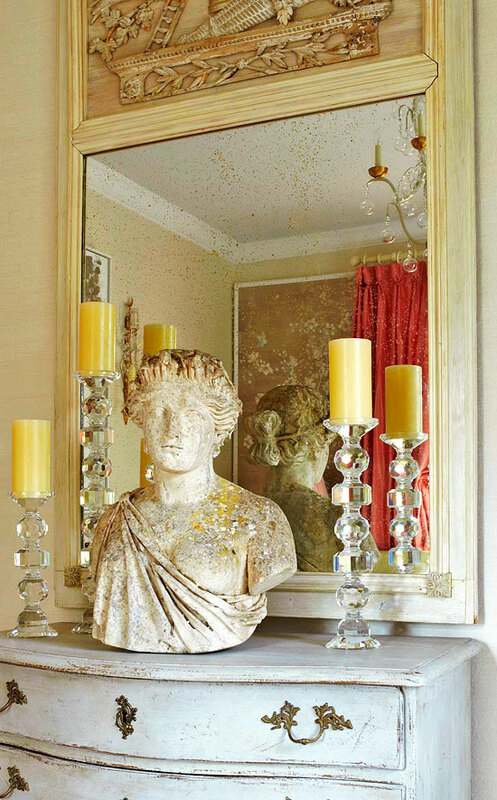 The mirror’s antiqued glass echoes the bust’s aged patina. The worn look of antiqued glass is a subtle detail that can enrich an ordinary space. Paired with this classic trumeau, the set gives off an air of uncompromising elegance. Tour the rest of the 2013 American Red Cross Designer’s Showhouse here. 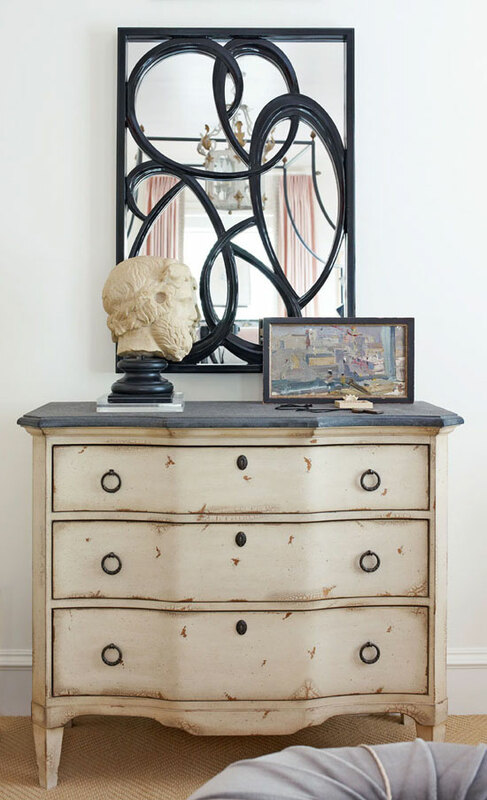 Above a chest of drawers with a distressed finish is a mirror with an artistic edge. Its inset of swirls lends contrast to the bright space. This mirror’s smaller size allows its ebony insets to make an even more striking statement against the bright surface of the mirror as well as the white wall behind. See the rest of this stylish townhouse here. Retro styles like sunburst mirrors make a great statement piece for any room. 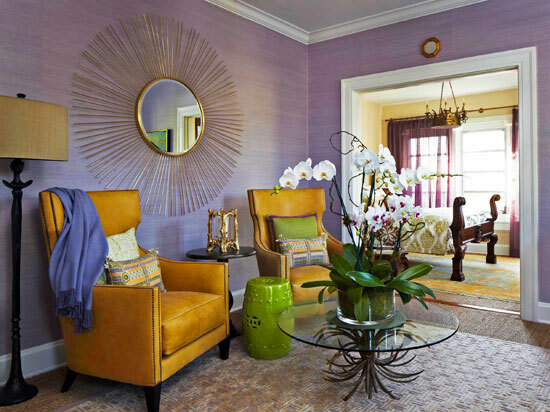 This bedroom sitting area, designed by Katherine Shenaman, is wrapped in a lavender wall covering and appointed with saffron-yellow wing chairs and pops of bright green. 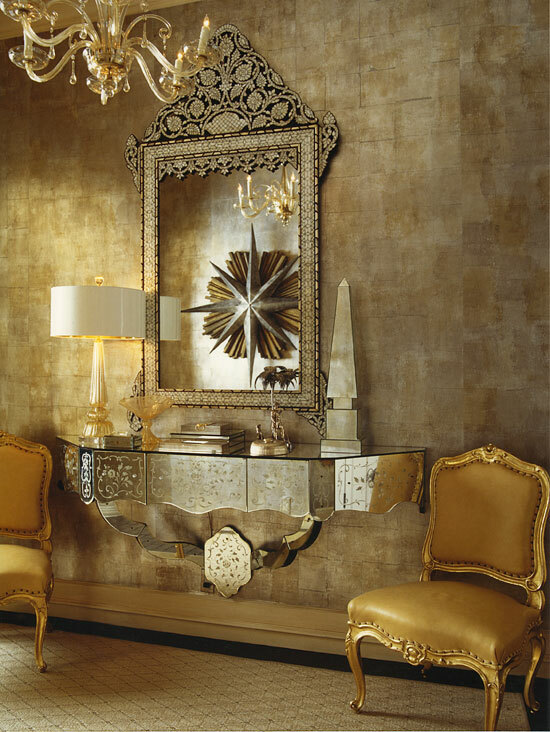 The large brass sunburst mirror adds texture to the wall and brightens the space. A mirror with such striking style as this works wonderfully as an art piece on a large wall. An inviting showhouse kitchen boasts a mirrored backsplash behind the bar, which reflects the lighting installed below the cabinets. 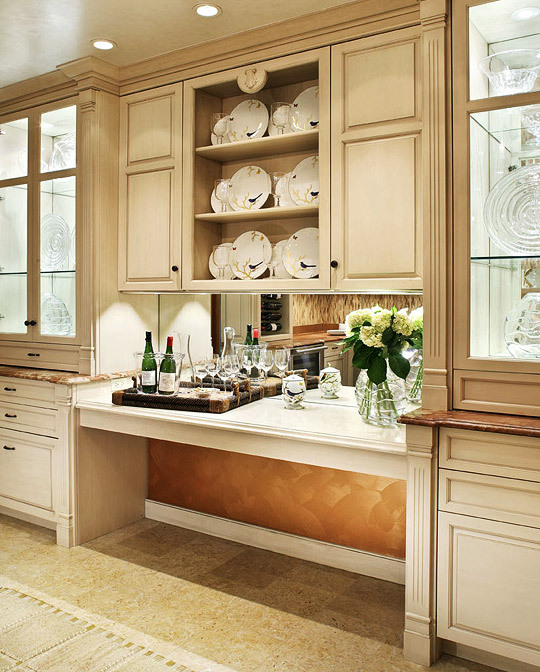 Flanking the bar are lighted crystal display cabinets, which also feature mirrored interiors. Mirrors are an elegant way to highlight a collection of glassware or crystal because they encourage more light to travel through the space, making the pieces sparkle! 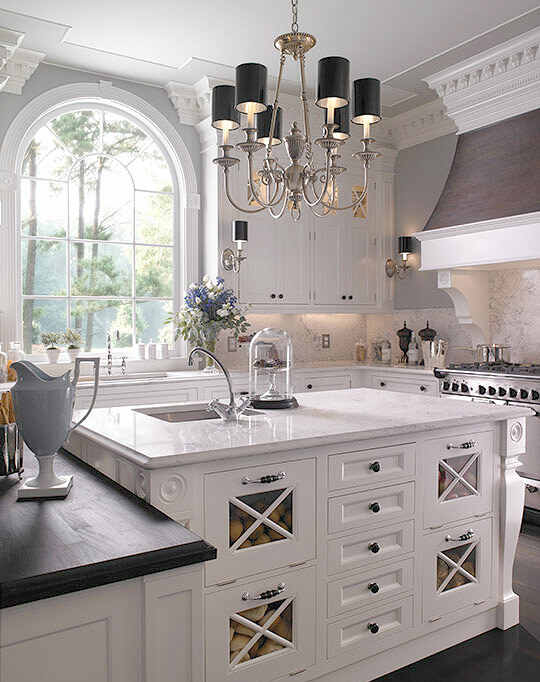 Take a look at the rest of this gorgeous showhouse kitchen here. Designer Eileen Kathryn Boyd suggests grouping ornamental mirrors together to create an interesting wall sculpture, rather than assigning each individually to a more formal space. This technique works with any collection of similar objects. 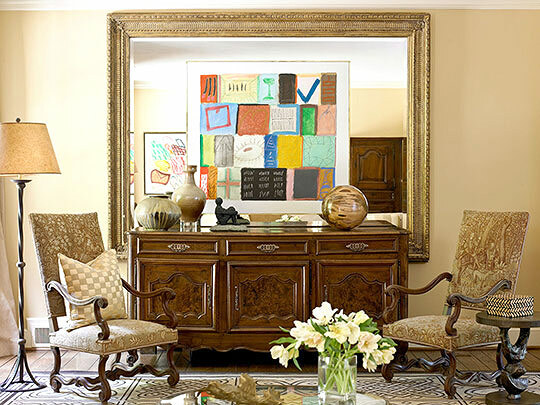 An assemblage like this one caters to those with the tendency to collect certain items—gilt-framed mirrors, for example. And never underestimate the power of grouping. It can be a source of endless fascination. 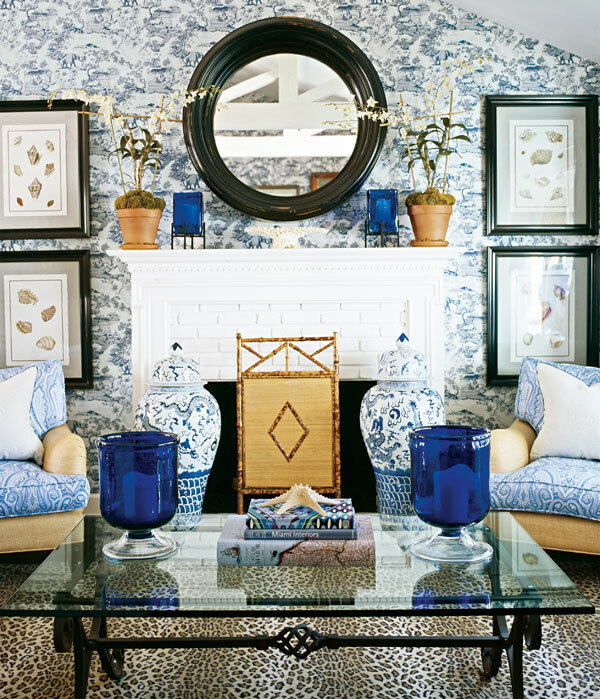 See more decorating tips from Eileen Kathryn Boyd. In designer Skip Sroka’s home, scale is everything. He topped the mantel with a large gold-leaf mirror, a similar size and shape as the living room’s tall windows. This keeps the lines consistent around the perimeter of the space, while reflecting natural light in the space between windows. Plus, the mirror conceals a television so it is easily hidden for formal occasions! The mirror’s subtle Greek-key motif is repeated in the living room’s rug and upholstery details, tying the space together. See the rest of Skip Sroka’s Washington, D.C. home. An arched niche in this showhouse powder room was the perfect spot for designers Melissa Ziober and Noe X. Guerra to make a statement. The circular mirror complements the niche’s rounded shape, while the grass cloth surrounding it lends texture. The mirror’s hefty size and shape give it serious personality, but its gilded edges and beige-toned paint allow it to blend in with the powder room’s subdued palette. 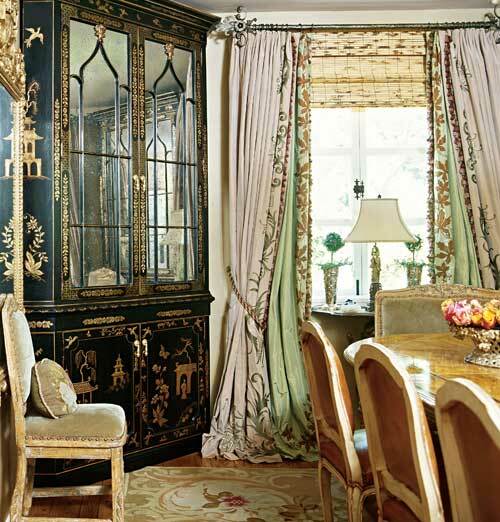 A chinoiserie corner cabinet boasts mirror-paneled doors and gilt detailing to bring traditional flair to this elegant formal dining room in the home of acclaimed actor Sidney Poitier. 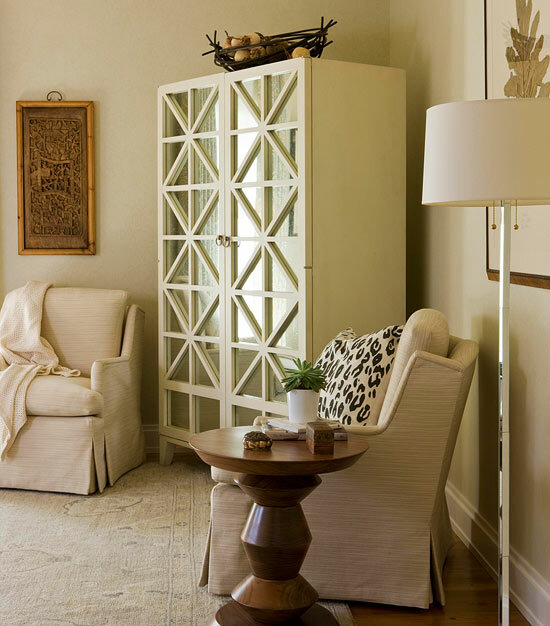 Large furnishings tend to add weight to a space, and mirrored details are a fabulous way to lighten the mood. This cabinet’s mirrored doors invite natural light into the corner, making the dining room appear larger. See the rest of the Poitiers’ home here. 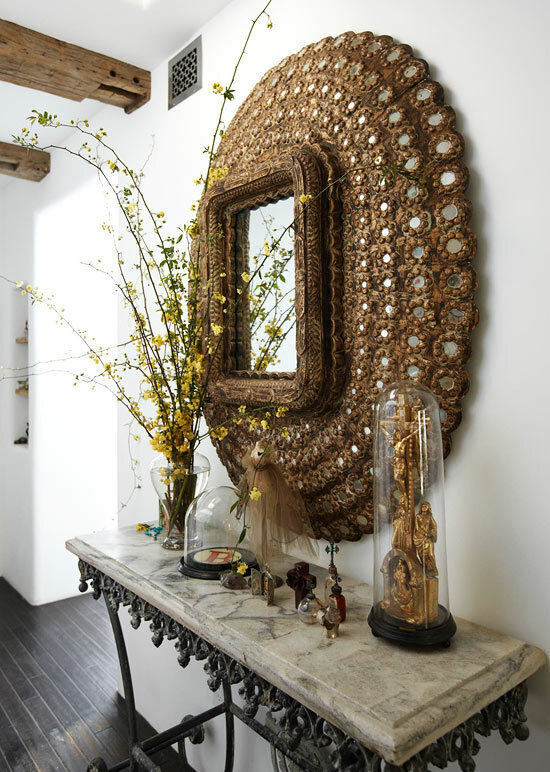 A large gold mirror with tiny mirrored inlays around the frame gives this entry hall an exotic touch. A collection of small cross-topped bottles and other artifacts tell of travels and adventures. A statement piece like this mirror can lend personality to any space, particularly when placed against bare neutral walls for maximum impact. Take a look at the rest of this stylish home here. 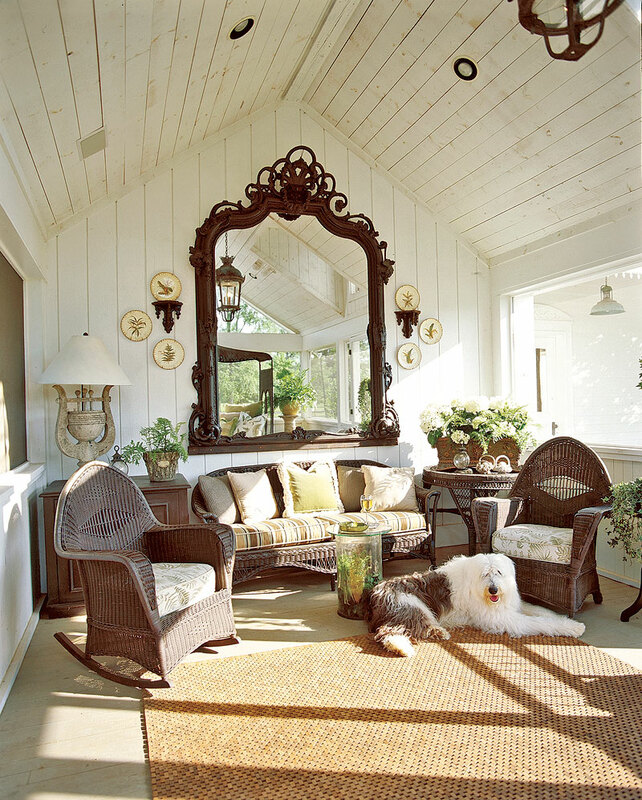 An antique mirror looms large over the far end of this sleeping porch, which is furnished with an eclectic mix of old wicker pieces and a thick rug made of wood from Boxwoods Gardens and Gifts. The mirror’s heavy frame and significant size lends scale to the lofty dimensions of the sleeping porch, and helps to ground the bright white walls and ceiling. Tour the rest of this summer home here. When paired with other reflective surfaces, like the paneled console and metallic wall covering in this entry, an artistic mirror makes an impact on the entire space. More decorating tips from Jan Showers here. A collection of variously sized convex mirrors establishes the focal point wall in this showhouse bedroom. The effect was glamorous without going over the top. The grouping’s asymmetry also complements the curvaceous chaise longue at the foot of the bed. 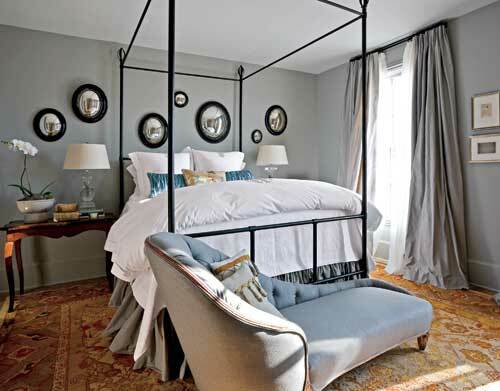 The mirrors’ black frames echo the frame of the bed and curtains rods, tying the room together with the same dark accent shade. Tour the rest of this Atlanta showhouse here. A large gilt mirror, which was left by the previous homeowners, finds new purpose as a surface for displaying a piece of modern abstract artwork, titled Symbols 81-1, by Ida Kohlmeyer. The colorful piece lends contemporary verve to the antique French chest and the pair of antique French walnut chairs, which still sport their original needlepoint. See the rest of this home here. 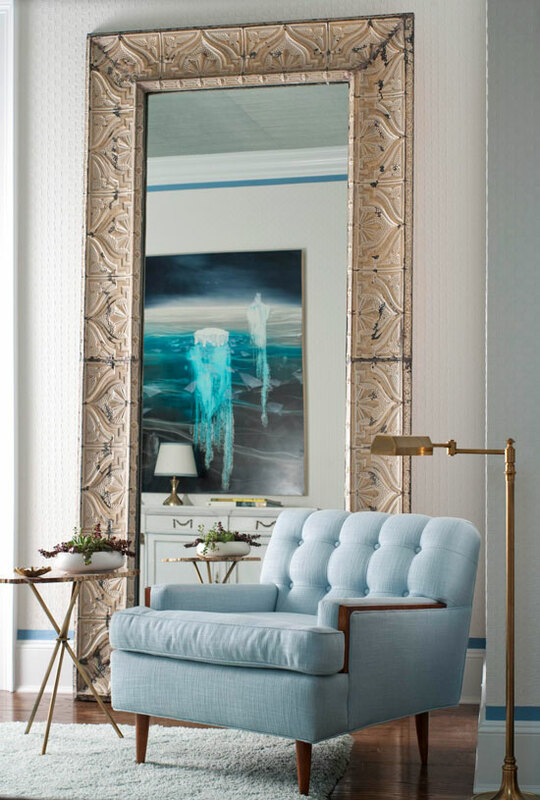 A vintage mirror stands tall above a tufted lounge chair covered in sky-blue fabric from Cowtan & Tout. The mirror’s neutral frame lets the room’s pastel palette shine without overpowering it. The verticality of the mirror contrasts with the long-and-low furniture throughout the rest of the space. Tour the rest of the 2011 Hampton Designer Showhouse here. 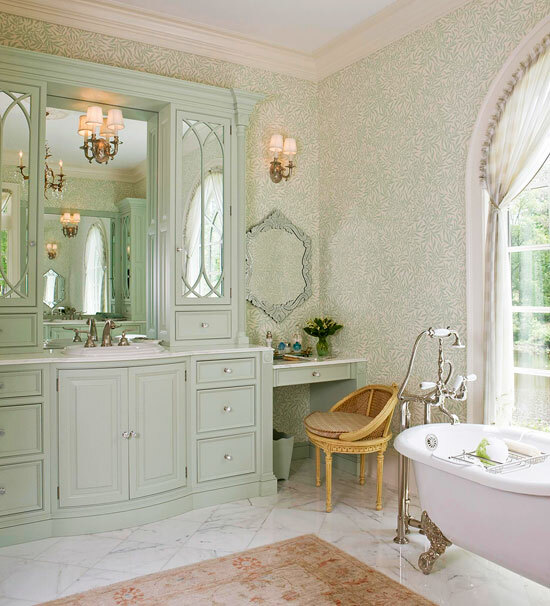 An antique wooden trumeau mirror hangs above the soaking tub in this bright white bath. The pop of wood warms the icy blue of the window seat upholstery. Small details, like the custom-made iron chandelier and metal legs of the side table, help to ease the wooden mirror’s impact on the all-white space. Explore the rest of this before-and-after Dutch Colonial remodel. A round mirror from Julian Chichester hangs in the entry of designer Samantha Todhunter’s residence for the Ritz-Carlton Designer Showcase in Chicago. The mirror’s shagreen-type texture adds interest, while its hue underscores the vibrancy of the hand-painted wall covering behind. The mirror’s simplicity adds to, rather than detracts from, the playful patterns behind it. The lacquered console table below also works to achieve this balance. Tour the rest of this showcase apartment. This formal dining room’s golden palette is the perfect place for an elegantly detailed gilt-framed mirror. The mirror’s glossy frame and reflective surface bring natural light from the adjoining library into the dining room, balancing the darker tones of the chairs and hardwood floors. View the rest of this gorgeous apartment remodel here. 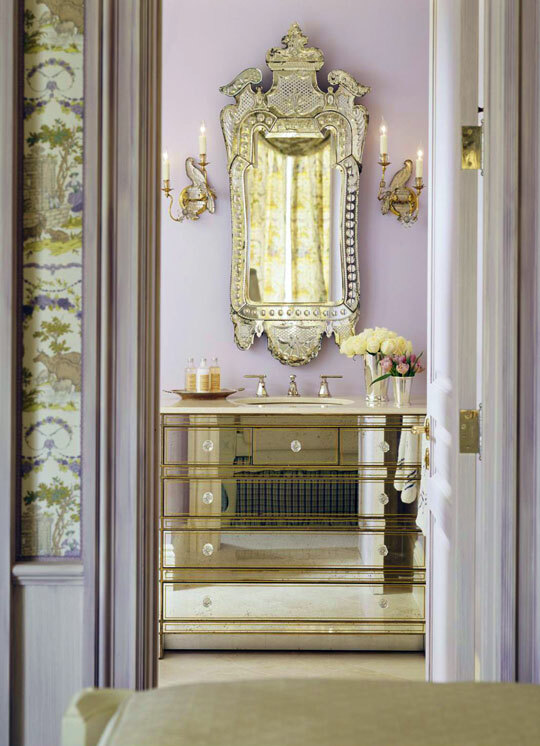 Designed by Kendall Wilkinson and homeowner Robin Donohoe, this lavender guest bath is accented with glittery gold and metallic details, but the starring role goes to the ornate Venetian mirror that hangs above the mirrored washstand. 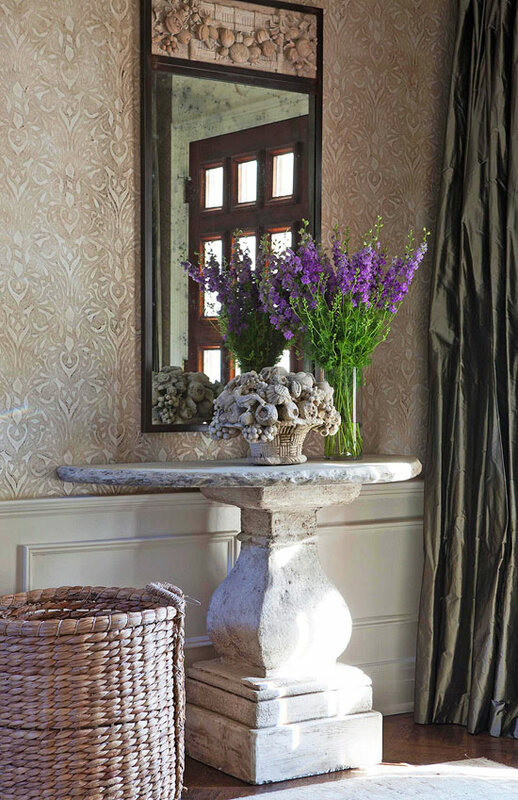 The room’s soft lavender walls and sparkling details keeps the space feeling fresh and feminine. Designed by Scott Laslie, this elegant living room’s focal point is the attention-grabbing fireplace. Above the polished quartz surround is a wall of bronze-tinted mirror that reflects warm light back into the room. Hanging over the bronze mirror is another mirror, this one antique and gilt-framed. The combination of the bronze mirror, framed oval mirror, and polished nickel fire screen dotted with crystals creates a warmly luminescent atmosphere that draws attention to this area of the living room. Tour the rest of the Built for Women Showhouse III here. 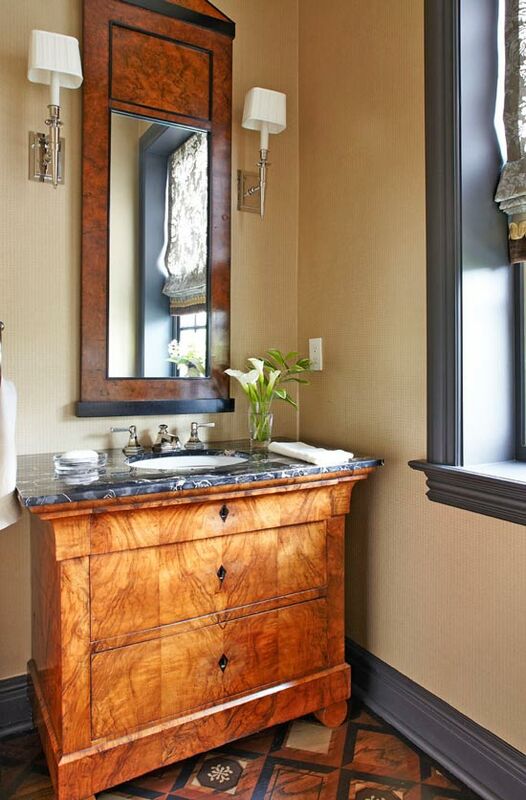 A classic vanity features mirrored front panels and elegant detailing in this serene boudoir. Glittering drawer pulls lend a touch of glam, while a built-in dressing table is presided over by a mirror from Cachet Ltd.
Aside from the vanity’s traditional charm, the accompanying sconces are positioned to be reflected in the multiple mirrors surrounding them for maximum reflection. It’s the ideal place to prepare for the day ahead. Explore the rest of this colorful Virginia home. 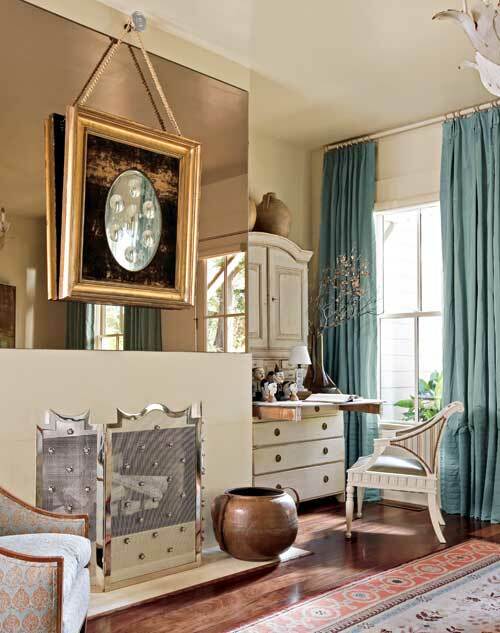 In one corner of this master suite designed by Jeff Andrews, a Regency-style desk from Lawson-Fenning doubles as a vanity when paired with a glamorous gilt scroll mirror from Fat Chance. This mirror is proof that a small piece can make a big impact: It fits the snug wall space behind the desk, while its gold frame complements the room’s cool palette. See the rest of this stylish L.A. home here. 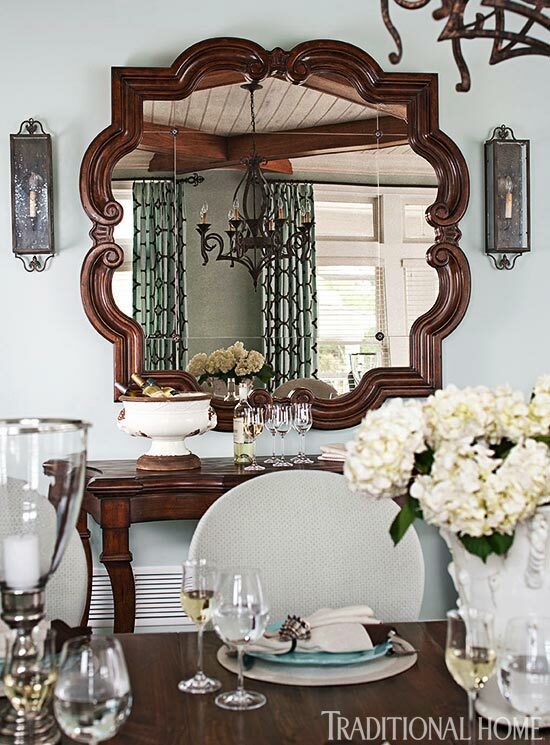 The “Julian Mirror” from Niermann Weeks boasts a distressed finish that grounds the foyer in this Virginia row home. The pairing of the glossy black lamp shade and dark glass of the mirror carry the visual weight of the scene, allowing more playful elements—like the ceramic green plant holders and the artwork over the mirror—to add character to the space. View the rest of this lovely remodel here. This modern master bath is both livable and stylish. The mirror is equipped with a built-in television, perfect for catching the morning headlines while preparing for the workday. The mirror, from Seura, is backlit so that it lights up the entire frame. This eliminates the need for wall scones or overhead lighting, keeping the space looking streamlined and contemporary. See more of Julia Wong’s Ritz-Carlton showcase apartment here. A custom ebony-stained mirror hangs above the mantel in this beach house living room, designed by Barclay Butera. The round frame provides visual weight to ground the room’s many patterns. The simple dark frame of the mirror is echoed in the set of framed prints on either side of the mantel, as well as in the iron base of the glass-topped coffee table, keeping the room’s heaviest tones balanced and symmetrical. Take a look at the rest of this Newport Beach home here. At the end of a long hallway, a trumeau mirror reflects the row of dazzling crystal chandeliers hanging from an antique silver leaf ceiling. The trumeau mirror boasts an eglomise finish, which adds interest to the mirror itself while also making the glittering hallway appear longer. See the rest of this sophisticated home. 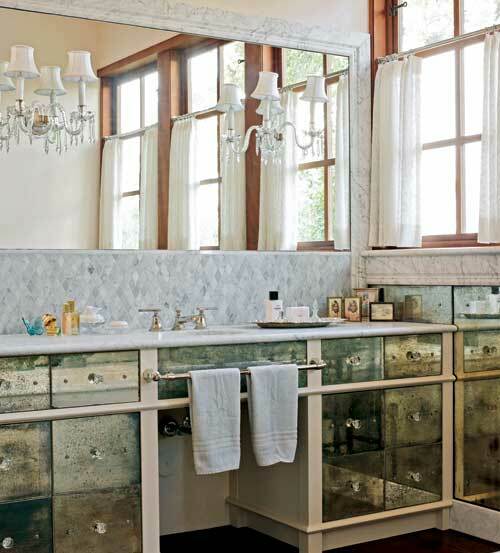 Antiqued mirror tiles form the front of the built-in vanity in this glamorous Texas bath. 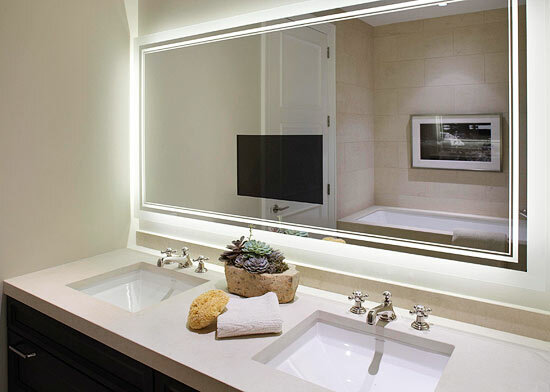 Shaded sconces are mounted on the large mirror above, doubling the light and illuminating the marble countertop below. Bathrooms are the perfect place for mirrors, and the more the merrier. This bath builds on its reflective personality with Carrara marble to keep the space bright and clean. See the rest of this Austin home here. Lively with color, this master bedroom pattern and texture for a playful effect. The sunburst mirror above the bed keeps the drama to a minimum while adding texture between the twisted bed posters. The mirror’s round shape works well between the bed posters and complements the room’s more linear details, like the stripe on the bedding and drapery from Schumacher. See more of this eclectic home here. An antique Biedermeier cabinet (c. 1850) topped with marble sits below a matching Biedermeier mirror, its height contrasting with the cabinet’s width and visually expanding the space. 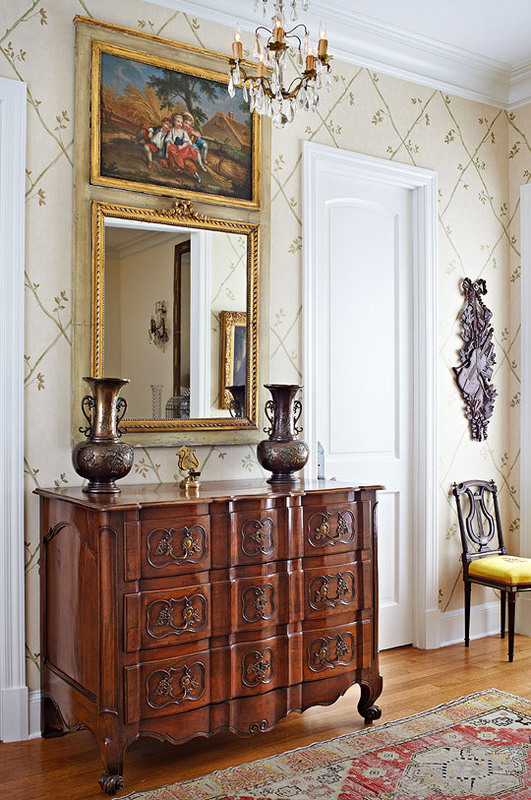 Layering antique pieces in one room lends timeless style and function. Tour the rest of this Georgian-style home here. 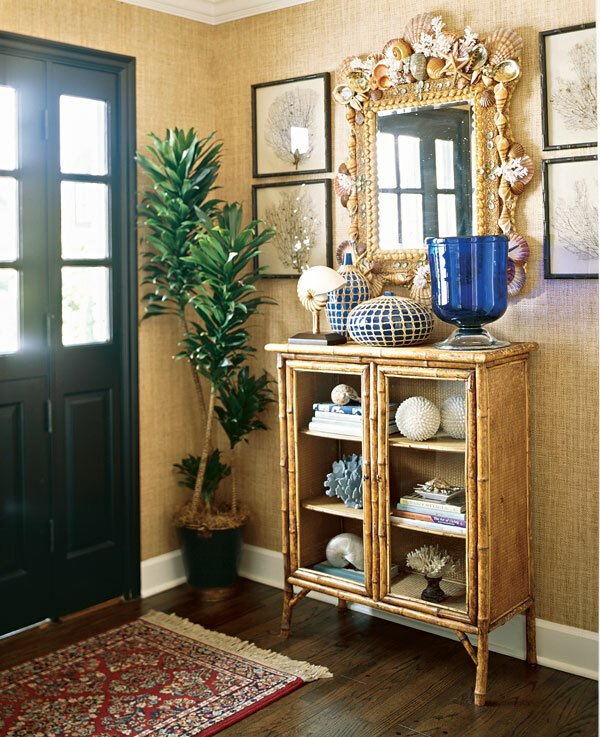 A Newport Beach home brings a touch of the shore inside with a seashell-encrusted mirror in the entry. More seashells line the shelves of the antique bamboo cabinet below. The pinks and yellows of the seashell mirror blend in with the woven wall covering and bamboo cabinet below, but all three elements inject the space with texture and keep it from blending together. 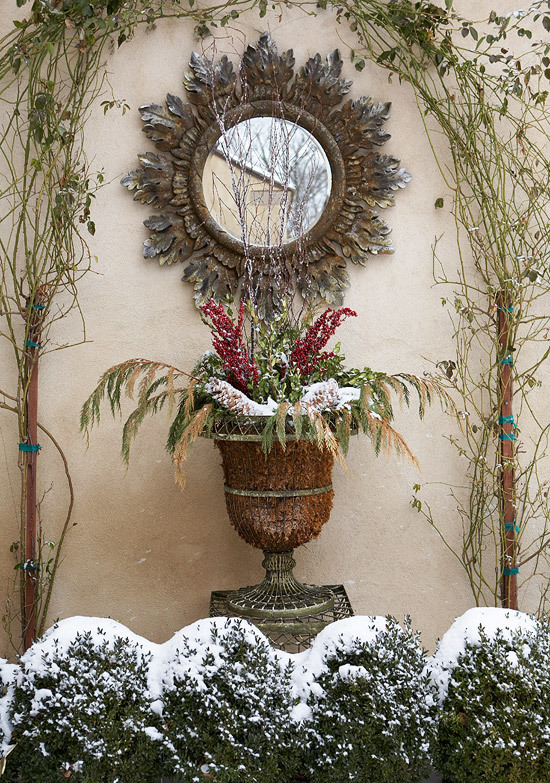 A snowy garden vignette is topped off with a vintage mirror hung above a wire urn filled with wintery greens. The mirror’s leafy frame gives the appearance of a sunburst but with a more rustic touch. Adding a mirror is a great way to incorporate an element of sophisticated design to a garden or outdoor setting. Take a peek inside this holiday house. 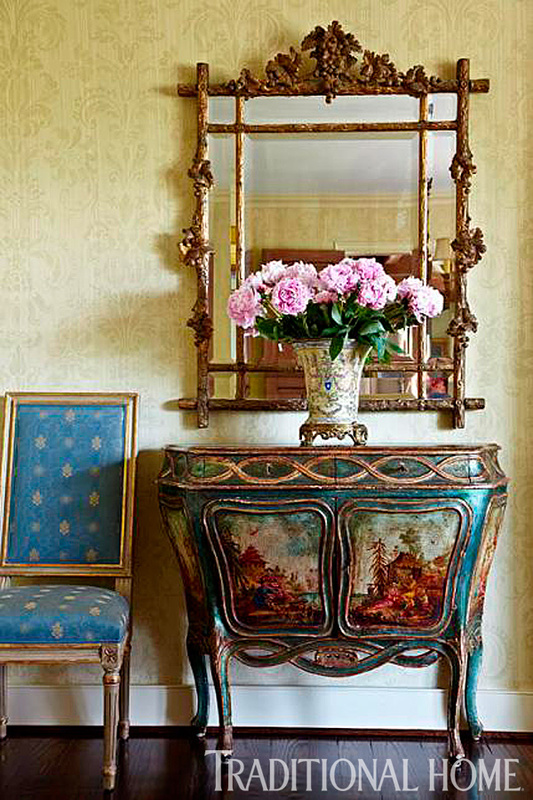 The foyer of this lovely Louisiana home carries some serious French flair. An 18th-century French fruitwood commode sits below another priceless French antique: The trumeau mirror is framed in gold and features a pastoral scene painted on the top panel. The colors of the trumeau’s painting and the wood of the commode warm the space, while gold details—like the mirror’s frames and upholstered seat of the lyre-backed chair—add interest. View the rest of this smart home here. 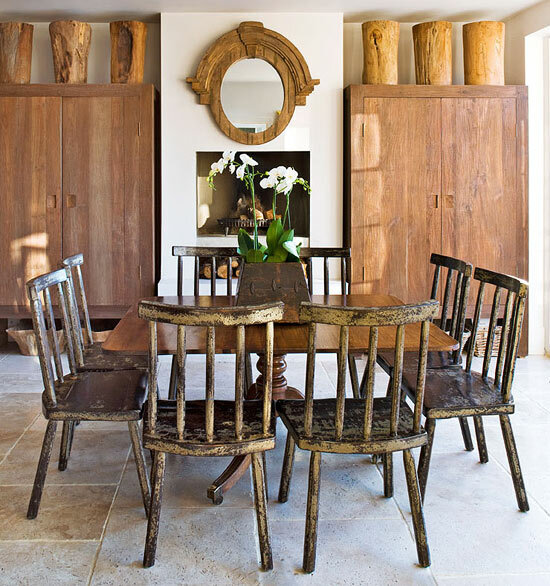 Wood is the word in this English dining room, from the chairs to the decor. The round mirror above the fireplace is made from salvaged wood, and stands out against the white mantel. In this symmetrical room, the round mirror is a nice focal point. Take a look at the rest of this English country house. In the sitting area of this serene guest suite, an armoire from Hickory Chair conceals a mini-bar behind its mirrored doors. Pieces like these are great for adding contemporary style to a space. The linear pattern over the doors lends interest to the corner, while the mirrored inlays provide the sparkle. 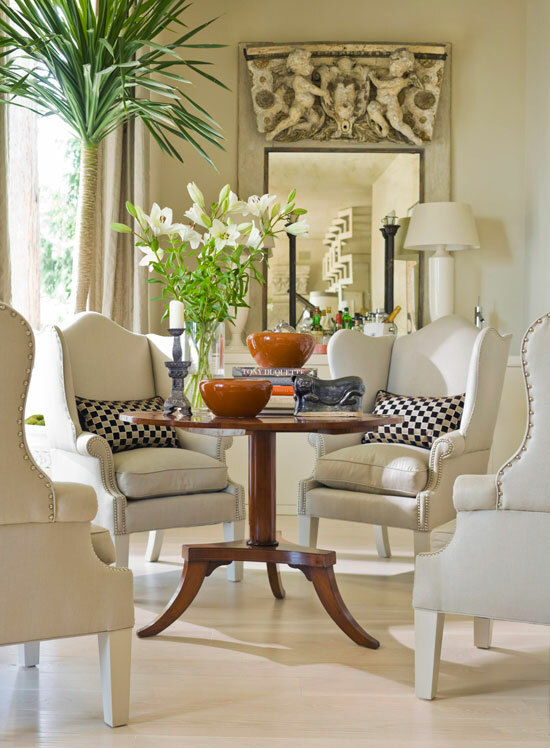 A wall of French doors with dramatic window treatments is broken up with tall mirrors in between the doors. 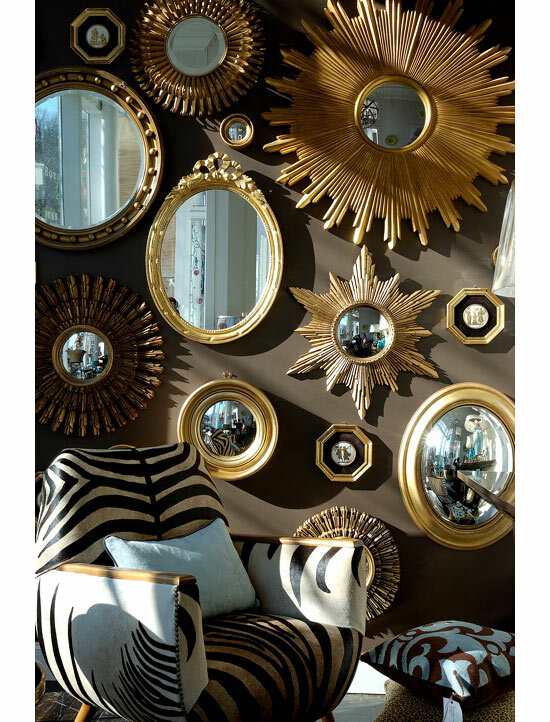 To achieve an aged look that would fit in with the room’s regal furnishings, designer Geoff De Sousa commissioned a decorative artist to give the mirrors’ frames a gold-bronze rub. Placing large mirrors in between the existing windows keeps the illusion of light consistent around the perimeter of the room. When space is scarce, like in this recent college grad’s brownstone apartment, rooms often need to pull double duty to retain their value. Subtle elegant details, like the Venetian-style edging of this mirror, lend a polished look to this desk area, which in turn allows the desk to double as a vanity. Imperfections are part of life, and can also benefit the buyer: This mirror was fetched at a bargain price from Anthropologie because of slight damage. See more of this “first nest” here. 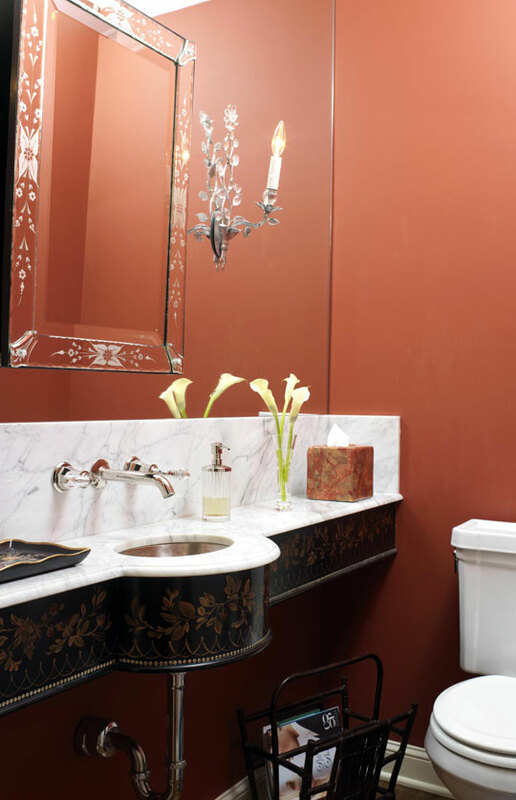 A tiny powder room maximizes its dimensions with a mirror over the entire wall above a marble-topped vanity, which also stretches wall-to-wall to conserve space. Not only do the wall-mounted sconces save space and double the light, but the second mirror hung over the wall features delicate details, which make the space feel more feminine and welcoming. This showhouse dressing room may have constrained dimensions, but pops of scarlet and a tall mirror from Ironies give the space style and depth. Rather than competing with the room’s moody palette, the mirror’s frame blends in with its surroundings and works to visually expand the space. 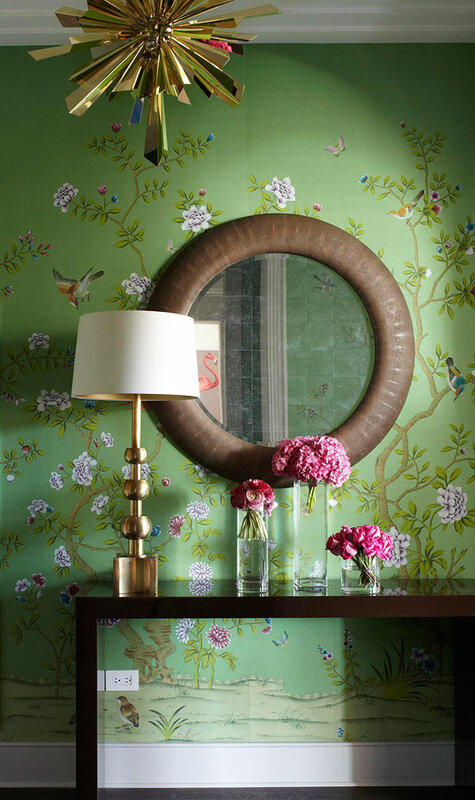 A large-scale wall covering from de Gournay wraps this powder room in a wonderful forest scene, which is reflected in the simple “Wendy Mirror” from Bradley Hughes. 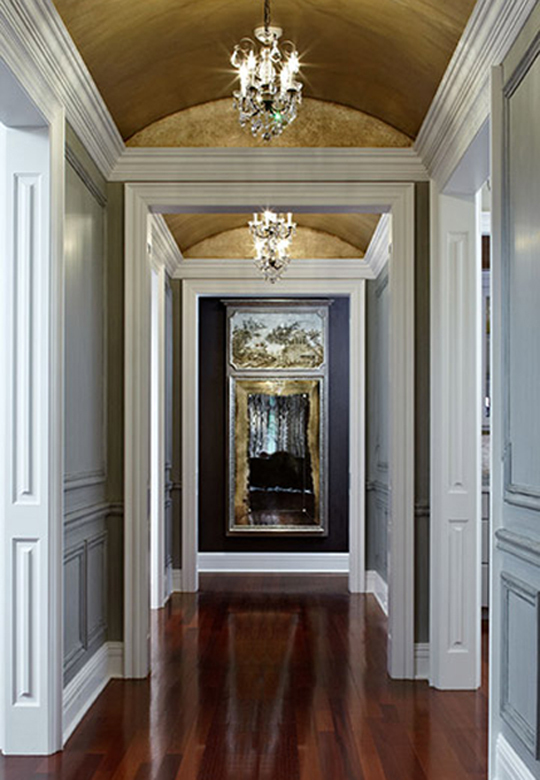 The mirror’s dark frame complements the dramatic wall covering and is balanced by the creamy wainscoting below. See the rest of Frank Ponterio's residence for the Ritz-Carlton Apartment Showcase here. This living room’s bar area is established by a quartet of wing chairs, but the statement piece is surely the antique French frieze fragment repurposed into a mirror frame. A piece of history as striking as this fragment is destined to be admired, and in its new life in this living room it is sure to have a stage. Tour the rest of this Northwest home here. 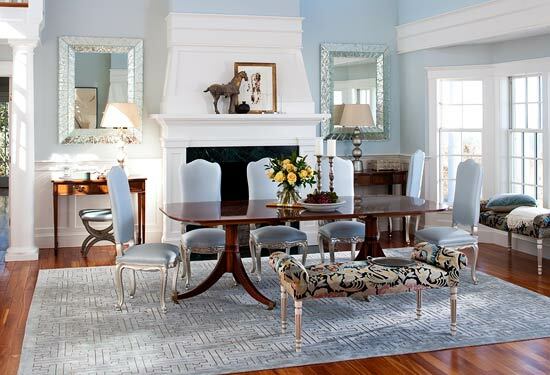 The dining room’s cool palette seems receptive to details that so closely mimic ice, like the mirrors’ chiseled edges. Explore the rest of this glamorous home. 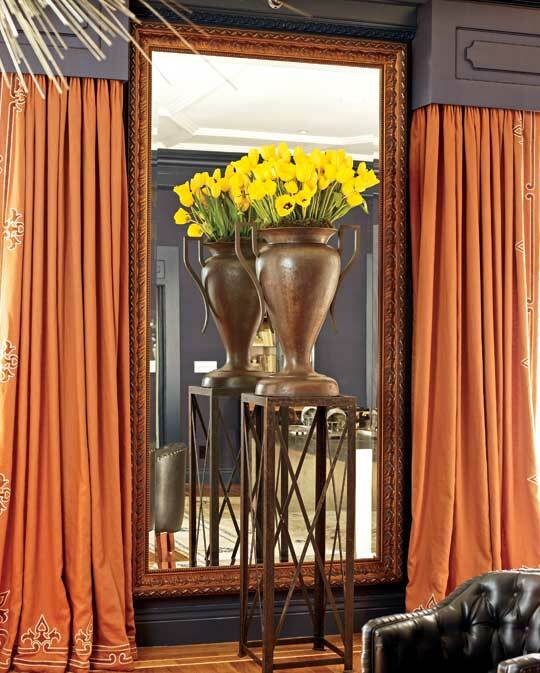 Antique carved limed-oak panels were used to create a custom trumeau-style mirror in this elegant foyer. This custom trumeau’s texture is reflected in the wall covering behind. See more of this light-filled Mediterranean home here. Thinking about a kitchen redesign? Check out these kitchen updates that really pay back!